Well, I'm back from yoga class and I am so excited to share my project for this month's VIP Blog Hop for My Favorite Things. It all starts on Kim's blog HERE, if you happened to have just joined me and want to see more fabulousness using this set. Yes, I think you do. What set is this? I'm glad ya'll asked. It's Who's That Birthday Girl? and she is "headlining" (haha) the VIP kit for this month! Now a little bit about what I've come up with here. 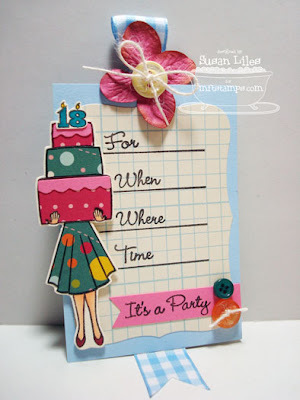 My daughter, Shelbie's 18th birthday is coming up and I'd like to have a little party for her, so I thought how perfect this would be for invitations and maybe a little placecard or gift card for a gift bag. I combined the Who's That Birthday Girl set with the FREE (in the kit) set, Invitation Only, along with 3 older MFT sets for my project (see below). See the little "18" candles on top of the cake? SO FUN that this set comes with all the numbers like that to make your own number candles! Now notice the invite--the new Invitation Only set comes with a stamp to make the lines. I needed mine to be a little shorter as I didn't want them going off the edge of my die cut. From the picture (my very mini tutorial--ha! ), you can see what I did by masking off where I did NOT want lines using Post-It notes. 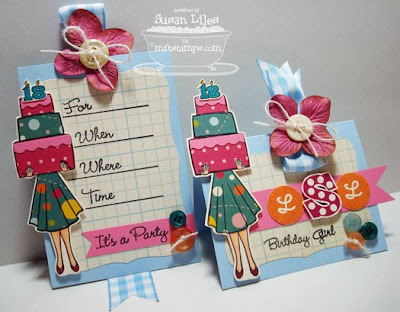 The little card can be used as a placecard to decorate the Birthday Girl's place at the table, or as a gift card to include in a gift bag. Since it's kind of small, I couldn't fit Shelbie's full name on it, so I opted for her initials, highlighting her "S" with the Bling 'Bet set and using the Alphadots for the other letters. It's a lot crammed onto a little card, but I like it! Anyway, ya'll are almost to the end of the hop, only one more blog left to go! Hop on over and see what Julie has come up with HERE. I know she won't disappoint! Have a great day tomorrow! Try Yoga!! SUSIE Q-TIP: For this project, I needed to string some twine onto my Prima flower up through the hole they have in the center and then up through the button to make a loopy ribbon thingy embellishment. I've learned to be gentle with the hole that's there and that it does no good to punch one larger as it tends to tear the flower. So there I was, trying to get these two ends up into the tiny hole/slot at the same time to create the loop of twine for my ribbon to go through, and it just wasn't working. That's when I realized I could just fold my twine in half and put the looped end up through the flower's hole on the backside of the flower. That was so much easier. Duh. Why didn't I think of that? Susan, I adore your work, so FUN!! Beautiful samples Susie. Thanks for tip about the twine and the prima. they are so cheery and bright, definitely party festive. Stunning colour! LOVE the layout too. You're makin' me wanna party (after I stamp this gal!) Gorgeous work! Just so lovely, great that you jammed it all on there, the embellishing and colours are gorgeous, my pick from the hop, excellent work! Gorgeous work Susan! I love it!! Gorgeous projects Susan! I love the fun bright colors! This project is just too cool! I love how you put all of those sets together to come up w/ something SO fabulous!!!! Great paper piecing! Really cute card. Love it! oh, wow! 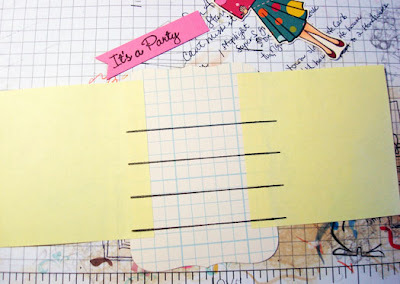 this is so fabulous with those papers-soooo cheery and fun! love it! This is FABULOUS!!!! It's like a party on a paper!!!! wow fantastic - can't believe all the cutting! Perfect for your daughter and the paper is so young and fun! Beautiful! I love how nice and bright this is!! Just gorgeous! 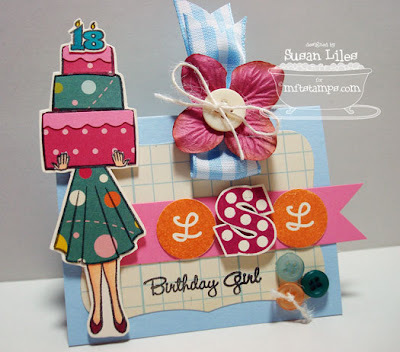 Susan,I am in LOVE with this MFT B-day Girl set... it's no longer available??? Love Love LOVE... the paper you used. the polka-Dot dress is super CUTE! Fabulous card. I absolutely love the paper pieced dress.